At any given time, the individual hairs on your scalp are in different phases; some are growing and others are resting. Normally, about 90% of hair is in the growth phase, called anagen. A single hair can be in the growth phase for several years and grow half an inch each month. The remaining 10% of hair is in a resting phase, called telogen. The telogen phase allows the hair follicle, which nourishes each hair, to rest before producing a new hair and starting the cycle of growth again. Hair is shed during the telogen phase. Accordingly, it is normal to lose about 100 hairs each day. However, in telogen effluvium, more hairs than normal enter the resting phase (telogen) and are shed. The word effluvium means “flowing out” in Latin, and this loss is often distressing to those experiencing it. Different types of stress can cause more hairs than normal to enter the resting phase, resulting in the hair loss seen in telogen effluvium. The trigger for hair loss commonly occurs 3 months before hair loss is noticed because it usually takes that long for a hair to go from anagen to telogen. In some cases, no trigger is identified. Your dermatologist or primary care doctor can diagnose the condition based on your detailed medical history, description of your symptoms, and examination of your scalp and hair. He or she may gently tug on your hair and look to see how many hairs are falling out and what phase of the hair cycle they are in. Blood tests may be needed to measure your levels of thyroid hormone, iron, vitamin B12, and folic acid to rule out abnormalities of these as a cause of your hair loss. 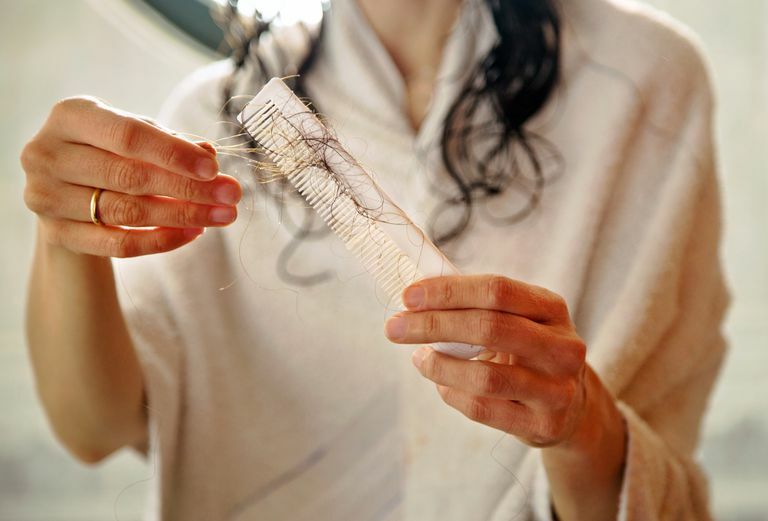 If another type of hair loss is suspected, a skin biopsy of your scalp might also be helpful. No treatment is needed for telogen effluvium since it is a condition that gets better on its own. There is no permanent damage to the hair follicles, and new hairs grow in the place of those lost. This is especially true in cases due to short-lived causes such as childbirth or an illness that you have recovered from. In cases where telogen effluvium is caused by ongoing stress to the body such as an overly restrictive diet or chronic emotional stress, hair loss will not stop until the underlying cause is resolved.